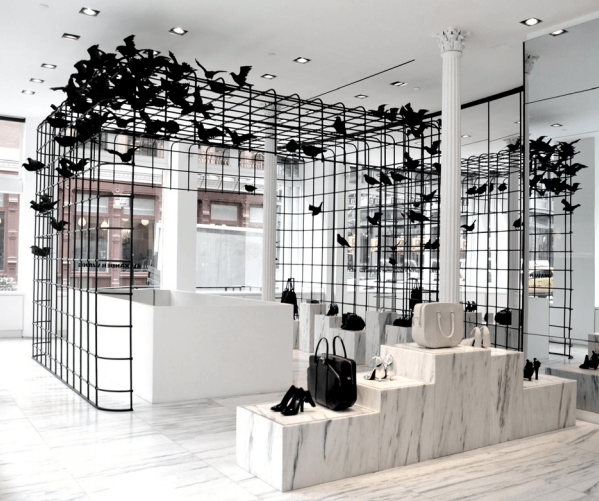 The cage – covered in birds – at the Alexander Wang Flagship in NYC. Photo Courtesy of Alexander Wang. 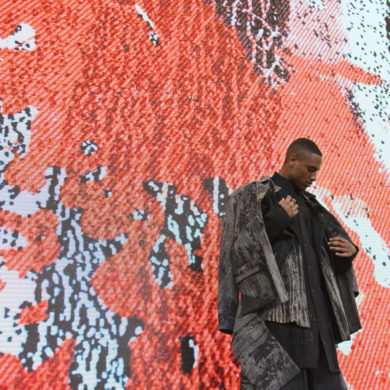 Fashion’s Night Out is always a major happening – especially in NYC. Thousands of fashion lovers dress to the nines and crowd into their favorite boutiques, hoping to catch a glimpse of their favorite designers, models, and bloggers hosting the myriad of events. This year, Alexander Wang is giving you a chance to get in on the behind-the-scenes action. He’s asking visual merchandisers, designers, architects, and artists of all kinds to design a cage installation for his New York flagship. The cage is used for seasonal displays, and the winning design – revealed on FNO – will be kept in the store throughout New York Fashion Week. The concept of the installation should stem from Wang’s Fall 2012 collection, which featured those oh-so-amazing mesh face masks and lots of leather. Past season’s visuals have included everything from red wrapping paper to massive black balloons and chevron-shaped fluorescent lights, so let you’re imagination run wild. Click here for entry details – and start sketching! Previous Danny Roberts’ Mural for Tiffany & Co.